Visioncrafting: A Self-Guided Journey is a personal workbook to help you to clarify your goals and ideals, identify the blocks that hold you back from achieving your dreams, and create a powerful and magnificent future. The process of changing our belief systems and creating a new vision for our life is a powerful one. I have created a process that I call Visioncrafting to help you to create a more powerful and dynamic vision for changes that we want to create in our life by strengthening and focusing our goals and ideals. Positive thinking alone is not enough, and affirmations Sometimes it is necessary to unlock old belief systems that no longer serve us and creating new, more empowering beliefs, and the Visioncrafting process helps to facilitate this as well. This Visioncrafting work begins with an examination of your birthchart to see where your skills and talents lie, and where potential blockages may be standing in your way of achieving your dreams. For more information on personal sessions visit my readings page. This new workbook will guide you through the process on your own, helping you to uncover the beliefs and ideas that have kept you from realizing your goals and dreams. If you choose to begin your journey with me, or if after reading the workbook you need some coaching, we will begin with a quick look at your chart to see where any blockages may lie and to see what planetary cycles are occurring over the next year. Then we’ll take the list of things that you want to change in your life (this will be your homework before our session), and I’ll help you to craft a powerful vision and accompanying affirmative statements to aid you in manifesting a new design for your life. You may also want to consider a few ongoing coaching sessions to help you to stay on track once you begin the process. For more information, email me directly. [Amazon review] For people who believe in the law of attraction and visualization this book is a wonderful tool for manifesting your goals. Whether you are a beginner in goal setting or you’ve had some experience with it (as I have), Lynn’s step by step workbook will take you through the process of creating a vision plan for achievment. I purchased the book last October and began the Visioncrafting process. By January one of my goals began to take shape. 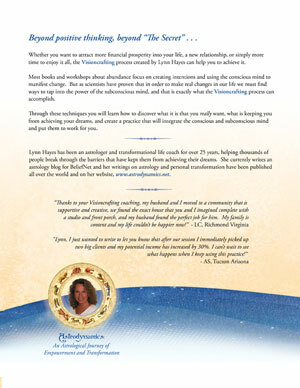 I believe Lynn’s method takes a different approach from some other LOA guides. Her Visioncrafting process is very practical as far as taking you through the process of creating and prioritizing your goals. The Visioncrafting process will help you establish a very clear, tangible vision. In my experience, the key to manifesting your goals is directly related to having a clear, workable, positive vision. Visioncrafting is the guide that will help you bring your goals to fruition. [Amazon review] VisionCrafting: A Self-Guided Journey Volume 1 presents clear, empowering and practical methods to support healthful living. Each chapter gives easy to follow, golden nuggets of valuable insight. Lynn’s years of experience and wisdom shine through each step of the way. She shares the techniques of making your personal dream a reality through a thorough step-by-step process. 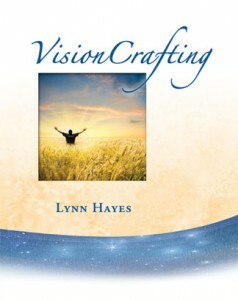 VisionCrafting is a wonderful guide, designed for beginners to experienced practitioners, alike. Hopefully, Volume 2 will follow shortly. [Amazon review] Visioncrafting is a lot of things in one small beautifully illustrated book. Lynn teaches metaphysical concepts and the law of attraction in a way that can be understood by someone new to these ideas but can also be appreciated by someone who has been a believer and a student of this for many years like I have. It is one thing though to believe that we create our own reality and that what we focus on expands. But to move beyond knowing into actually creating the life of your dreams, the beliefs that hold us back need to be looked at and the vision and wishes need to be felt at a subconscious core level of our being. In this book Lynn is able to do both, teach the concepts and anchor the feeling and emotions that are needed for real change. Lynn has been one of my teachers in this for many years and I have been able to draw my soul mate to me by practicing exactly what Lynn teaches.